I'm always on the lookout for healthy snacks and meals that can be prepared ahead of time and enjoyed with only a moment's notice. And if said nourishment can be prepared by my independent children, then I'm an extra happy mama! 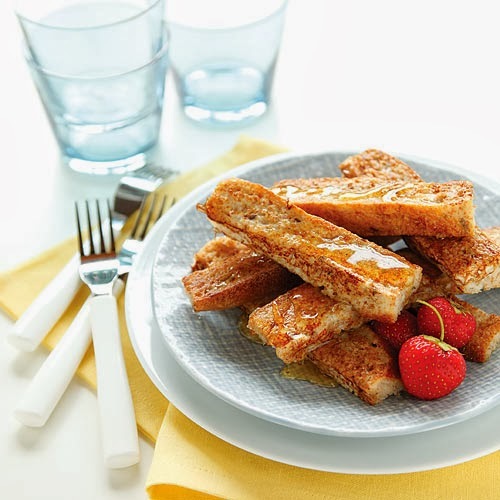 These french toast sticks meet all of the above criteria...plus, they're delicious. That's what I call a win-win-win! Preheat oven to 350 degrees and coat a cookie sheet with cooking spray or butter. Cut each slice of bread into thirds. Mix/beat together melted butter, eggs, sugar, cinnamon, vanilla and milk in a wide mixing bowl. Dip each stick into the egg mixture (take a bit of extra care with the middle slices), place them on the cookie sheet, and bake for 25 minutes (flipping them halfway through the baking time). Cool on tray to room temperature and then flash freeze them (still on a tray). After they're frozen, they can be stored in a freezer-safe container of your choice. Half of our initial french toast sticks never made it to the freezer...the kids came running into the kitchen when they smelled the baked cinnamon and vanilla and dug right in. The rest were reheated, three at a time, for about a minute on high in the microwave and served with maple syrup.